Exports: Supplying goods to foreign customers. Data compiled from Manufacturers’ Outlook 2017 shows the current and anticipated future states of Canada’s manufacturing industry. This article will take a deep dive into some of the trends expected in 2017 for the manufacturing industry. Growing sales to North American clients will be the focus of manufacturing success over the next three years. This expansion will be focused in the United States as their manufacturing industry is also poised for growth. New product development will also be driven by the intentions of gaining a competitive edge on other manufacturing businesses. 44% of manufacturers will be developing new products over the next three years to maintain a unique selling proposition. Product research and development projects can receive funding from several manufacturing grants. The Industrial Research Assistance Program (IRAP) is one of the best places to start. Employee training programs, either internal or through a third party trainer, will be a primary investment area for approximately 60% of manufacturers over the next three years. Capital investments into machinery, equipment, and technology will also require consideration over the next 3 years, as 55% of manufacturers will require improvements in this area. Research and development into new innovative products or processes will also be a major investment trend over the next three years. With 37% of manufacturers expecting expenditures in this area, significant breakthroughs will be made and lead towards greater productivity. Training grants, such as the Canada Job Grant may provide up to 50-83% in support for third-party training costs to a maximum $10,000/trainee. Employee training programs will be the primary method used by manufacturers to improve productivity. A combined 87% of manufacturers have either performed or plan to perform employee training within the year. Investing in advanced technologies will also support these productivity enhancements. Up to 74% Canadian manufacturers either have or will purchase or develop new technologies to perform tasks more effectively. Productivity strategies will also be explored, either formally or informally, by more than 60% of manufacturers this year. Formalized, purpose-driven strategy sessions will help to conceptualize large-scale changes, while lean/six sigma activities can help to identify incremental improvements over time. Internal cash flows are still the most often used sources of financing for projects, however, this rate has declined from 70% of manufacturers in 2015 to a mere 42% in 2017. Bank financing, another traditional source of investment capital, will also decline in popularity this year. Alternately, Canadian government funding programs are also expected to receive more interest from the manufacturing industry this year. Approximately 18% of businesses surveyed have an active focus on securing government grants and loans, up from 16% over the past two years. Will your organization use manufacturing grants and loans? Learn more about funding with Mentor Works’ Small Business Funding Guide. Fortunately, Canadian government funding programs to support research and development are available to most Canadian manufacturers. Sales and marketing are other skillsets where many manufacturers have difficulty finding qualified talent. In fact, 31% of Canadian manufacturers deal with a shortage of these skills, which leads to unexplored/unperformed business opportunities. Growing your organization’s sales and marketing departments can be tough, but has its share of benefits. Production staff and labourers are next in high-demand. 29% of manufacturers believe production and support skills to be an issue, while 27% of employers have difficulty finding labour for less-specialized tasks. To keep production moving, these skills must be addressed. Training Grants: Manufacturers may be eligible to offset up to 50-83% of training costs to a maximum $10,000/trainee through the Canada Job Grant. Unsurprisingly, investments in innovation are expected to increase over the next five years for many manufacturers. In fact, 48% of survey respondents claim they will increase investment, while only 3% of manufacturers believed they would decrease innovation project expenses over the same time. This speaks to the need for innovation, and how manufacturers must explore new products and processes to enjoy long-term competitiveness. The Canadian government supports business innovation by providing grants for research and development projects. Forward-thinking manufacturers can leverage these funding programs to increase their investment in innovation. Is expanding cash flow a priority for your manufacturing growth? 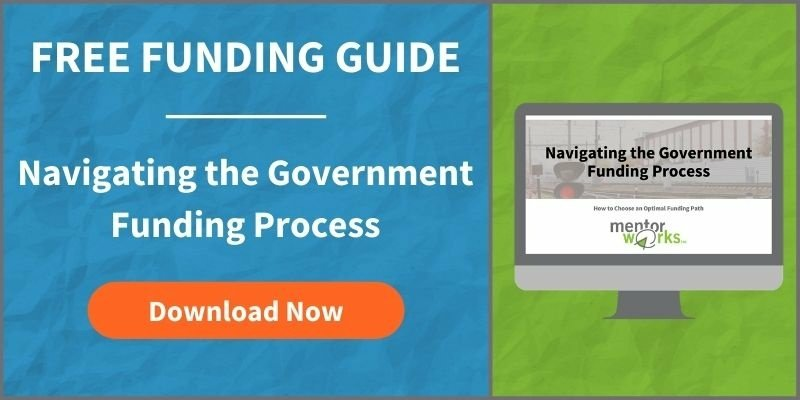 Build a Proactive Funding Plan™ to leverage government funding for projects. Computer-aided design (CAD), engineering (CAE), and manufacturing (CAM) technologies are undoubtedly the main focus for manufacturers who’ve made significant technology investments in the past. These automated systems improve capabilities, reduce errors, and generally improve productivity. Data management and control technologies are also driving innovation across Canada. 34% of manufacturers claim they are currently using the technology to understand and make more informed decisions about production data. Although its only currently used by 12% of manufacturers, 3D printing technology has proved its ability to drive innovation. As the advanced manufacturing technology and materials become more affordable, manufacturers will adopt them to develop sophisticated prototypes in less time. Purchasing manufacturing machines for small business? Capital investment grants could help secure additional funding for your project. For those forward-thinking manufacturers who would rather purchase energy-efficient equipment, Canadian government funding programs can offset project costs. Carbon emissions are the by-product of burning fuels to create energy. Manufacturers often create emissions with boilers or other pieces of machinery that use large amounts of energy. It’s surprising to see so few manufacturers (17%) who are actively taking steps to reduce their carbon emissions. Carbon taxing and cap and trade legislations will make avoiding these actions more difficult in the future. Nearly half of Canadian manufacturers (46%) aren’t planning or implementing carbon reduction measures of any kind. This could hurt competitiveness in the future when legislations are further tightened. Of the 54% of manufacturers who are implementing projects (either directly or indirectly) to reduce ca rbon emissions, 76% implement waste/scrap reduction initiatives. These projects specifically look at engineering and producing products in a way that uses less material or energy. ental impact. 60% of manufacturers are exploring new ways to improve their facilities and reduce energy demand. Water use projects are another popular choice among Canadian manufacturers. 37% of businesses will prioritize the exploration of better water use policies. Also, manufacturing executives should engage employees in sustainability projects to improve outcomes. Approximately 30% of employers currently do this to solidify environmental practices throughout the company culture. Energy Efficiency Grants: Manufacturers may be eligible to offset up to 50% of costs to a maximum $200,000/facility through the CME SMART Green Fund. Have Government Actions Changed Environmental Priority? When asked if government rules/regulations were impacting how manufacturers prioritized energy efficiency projects, most responded negatively insisting that their own internal prioritization system trumped government recommendations. Only 21% of Canadian manufacturers responded positively to the question; these early movers may have the advantage when accessing government grants, loans, and other incentives designed to attract clean energy investments. The Government of Canada may fund a portion of innovative clean technology projects through programs like the CME SMART Green Fund, SD Tech Fund, and the Build in Canada Innovation Program, to name a few. Development of new export markets is one of the areas where Canadian government funding programs work best. These business expansion grants are ideal for trade show participation, but also support other activities. Canada remains the top market for Canadian-produced goods. There are many reasons for this, including a wide network of manufacturers, and the removal of currency fluctuations. 62% of all manufacturing revenues come from Canadian customers. As close neighbours to Canada, the United States remains our top export destination for manufactured goods. 25% of manufacturing revenues come from American customers. Low-cost manufacturer, China, is last of the top three purchasers of Canadian-manufactured goods. 3% of manufacturing revenues come from Chinese customers. Although the United States has traditionally been the focus for new market entries, Canadian markets will be explored more actively than in previous years. 33% of manufacturers will enter Canadian markets in 2017, down 3% from 2016. The United States is a close second; 32% of Canadian businesses will explore American export markets over the coming year to continue diversifying markets. Mexico places third this year, surpassing Western Europe as a top export market for Canadian manufacturers. Approximately 14% of businesses will explore new opportunities to sell their products to Mexicans this year. CanExport grants help exporters enter new markets by offering up to 50% of project costs to a maximum $50,000 for travel and participation in international trade shows. competition is most often cited. Businesses are generally unaware of the exact competition level and are more likely to avoid the market because of this. 32% of manufacturers will avoid increasing their exports this year because they anticipate foreign competition will be too high. Currency fluctuations are a common risk associated with exporting. Especially when working with a foreign entity for an extended period, or managing large deals, currency fluctuations have the chance to turn profitable relationships into losses. 26% of Canadian manufacturers will limit exports over the coming year because of this factor. Lack of internal resources, such as financial and human resources, can delay or derail export expansion projects. As many as 15% of Canadian manufacturers would like to expand their exports in the coming year but cannot currently explore those possibilities. Manufacturers can gain access to an extensive list of exporting resources and funding programs by downloading Mentor Works’ Export Expansion White Paper. Many of the trends identified through PLANT Magazine’s Manufacturers’ Outlook publication suggest that Canadian manufacturers should be optimistic about 2017. Given proper financial support for projects, manufacturers will be able to leverage current opportunities and become even more profitable. However, this growth will not be possible using traditional methods of financing, such as internal cash flows or using products offered through a financial institution. Manufacturers must explore using government grants and loans, more now than ever, to afford their business expansion initiatives. Small business manufacturing grants are available to most incorporated entities operating in Canada. Learn how to factor funding into the project planning process by downloading Mentor Works’ Proactive Funding Plan™ slide deck.